Are you a triathlete? Do you run or jog regularly? Are you looking for a moisture-resistant watch that can handle the punishment of regular running? Need a time piece that won’t burn a hole through your pocket? 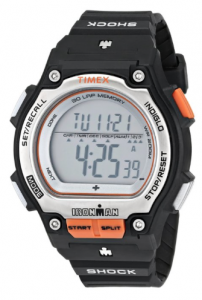 If you answered YES to any of the above, you should definitely consider the Timex Men’s T5K582 “Ironman” Watch. This watch has everything a serious daily runner is looking for. Digital display for easy information reading? Check. Light construction? Check. Durable resin wristband? Check. Robust moisture resistance? Check. Make no mistake about it, this timex watch has your back covered whether you are running, biking, or swimming. Competing in a triathlon is an achievement in of itself. With this time piece, you can have a reliable watch that can help you track your progress at every stage of your competition or training. If all the features above have you excited, wait for the clincher: this unit only costs $55.77. Talk about a solid value from a recognized name in the world of modern watch making-Timex. The great thing about this watch’s design is that there are no frills. Every feature you see on this unit actually helps users who run triathlons or run long distances. Trying to measure how fast you cover a mile? There’s a stop watch feature to help you do that. Need an alarm to measure the distance you’ve covered? There’s an alarm feature that has you covered. While packing features into a sport swatch is something most watch manufacturers can do quite easily, what separates great sports watches from weaker models is how integrated everything is. You shouldn’t have to whip out a manual to figure out which button does with which function. And this intuitive design quality is what makes the Timex Men’s T5K582 worth writing home about. Everything is laid out simply. If you want to light up your display, press the Indiglo button. If you want to change modes, just click the mode button. Quick and easy. Versatile and oh so helpful. That’s how the Timex Men’s Ironman” watch is designed. Thanks to tried and proven quartz movement technology, you get a truly shock-resistant watch that can handle all the shock and punishment a grueling triathlon can dish out. If you’ve read the details above and it still isn’t clear, let me bring the point home: the Timex Men’s T5K582 is serious about giving you the time and time measurements you need while outdoors or on a track. In fact, this watch has you covered regardless of whether you are zipping along on your bike or you’re surging ahead in the water. With a water depth resistance of 600 feet, you can rest assured that you can still time yourself while you are in the water. Even if the trail gets rough, this watch can still time you accurately thanks to its shock resistance feature. If you are looking for a time keeping tool that can help you get a competitive advantage as you prepare for or compete in a triathlon, you should definitely take a long hard look at the Timex T5K582. This is a tried and proven iron man watch.